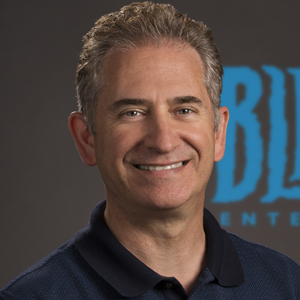 As president, CEO, and cofounder of Blizzard Entertainment, Mike Morhaime is dedicated to maintaining the high standard of quality that has propelled Blizzard to the pinnacle of the gaming industry and positioned the company as an internationally recognized leader in interactive entertainment. In February 1991, Mike cofounded Blizzard with Allen Adham and Frank Pearce. Under his direction—first as a company vice president and then as president since spring 1998—Blizzard has grown from a third-party development studio into a premier publisher of entertainment software, with a track record that includes twenty-one #1 games and numerous Game of the Year awards. Over the past decade, Mike has also overseen Blizzard’s transformation into a global enterprise. The company now has multiple offices in North America, Asia, Europe, and Latin America, and thousands of employees worldwide. Beyond his leadership responsibilities, Mike has had a direct hand in the development of each of Blizzard’s blockbuster franchises. He worked as a programmer and producer on games in the critically acclaimed Warcraft, Diablo, and StarCraft series, as well as on the company’s online gaming service, Battle.net, and served as executive producer on the world’s most popular subscription-based massively multiplayer online game, World of Warcraft. Most recently, he has guided Blizzard’s expansion into new genres and franchises with Hearthstone, Heroes of the Storm, and Overwatch. Mike earned a Bachelor’s degree in Electrical Engineering from the University of California at Los Angeles in 1990. In his free time, he plays bass for Blizzard's in-house and in-game band, Elite Tauren Chieftain.